Folder Color is a Nautilus extension that allows you to easily change the folder icon color to some predefined colors such as blue, pink, black, yellow, violet, orange, green, grey or red. With a small tweak, the extension also works with Nemo file manager. Its purpose is not to create new icon themes - the tool is useful for easily spotting a folder. For instance, you can change some important folder icon color, organize your music folders by using different colors for various artists, organize your documents folders and so on. 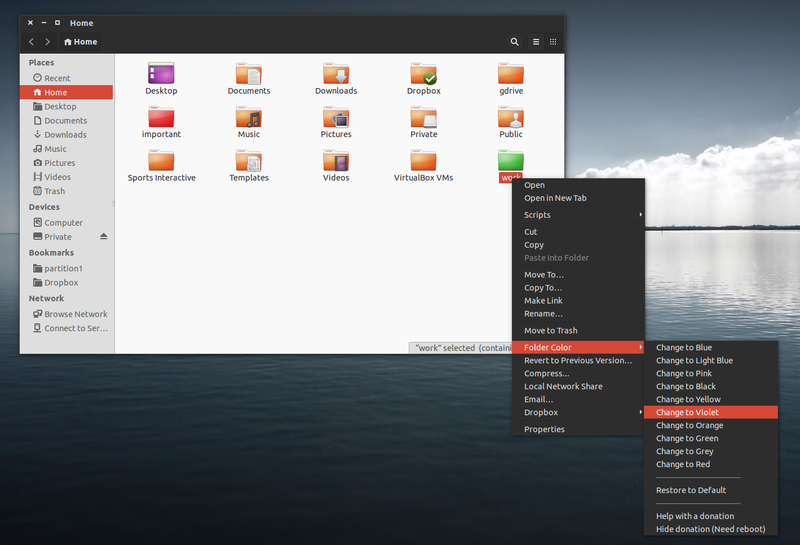 Note that Folder Icon only works with the default Ubuntu icon theme. As you can see from the screenshots above, you can easily revert the folder icon to default by selecting "Restore to Default". Update: Folder Color 0.0.9 was released and includes scalable icons, emblems for the default folders and also, the light blue folder color was removed and two colors were added: brown and cyan. Or, if you don't want to add the PPA, you can grab the deb file from HERE. 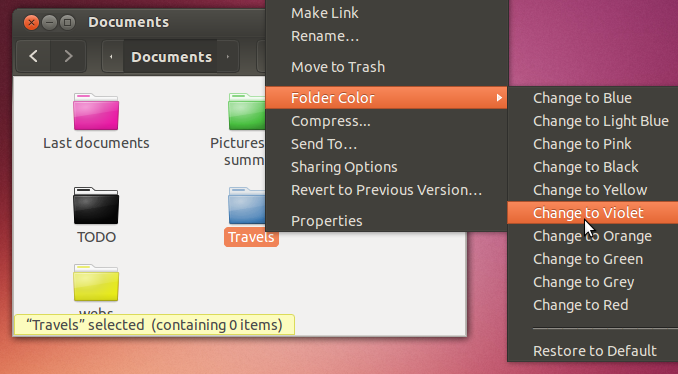 If Folder Color doesn't work with Nemo, you may need to apply the fix listed under step 4 from HERE. To download the source code, report bugs, etc., see the Folder Color Launchpad page.